I've wanted a pair of elf slippers ever since I can remember. When I missed my window, I thought I would make some for my son. Missed that window, too! He says "no way" to elf feet at ten years old. Can't blame him. When I made my daughter's toadstool slippers last month, they seemed to fall into that gnome/fairy category... but not quite elf. Maybe I made them too small subconsciously? Not sure, but I couldn't wait to make my own pattern, this time. I wanted that quintessential curled up toe look. When you make your own patterns, it's always nice to do a trial run through with an inexpensive fabric... just to check your fit. With clothing, I've used muslin. For these slippers, I tried a scrap of cotton batting. It behaves exactly like felt and helped me make the perfect size and shape!! I can't believe what a wonderful resource it is. I'm loving batting for all of its unexpected uses. Creating the pattern is the first step. I'm not including a pdf, but will gladly make one if I get enough requests. Instead, I will give you the measurements for a 4-6 year old and instructions for how to make any size. That's right, I could still make myself a pair. You'll be the first to know if I do! Draw measurements onto an 8x11 sheet of paper. Use my numbers as guides. 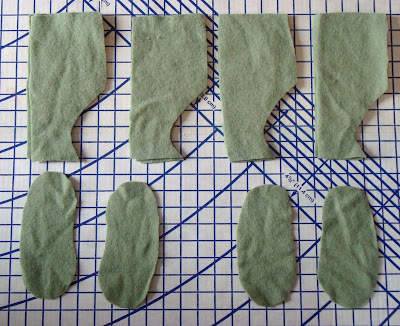 Make the sole by tracing your child's foot. If your child's foot is smaller, you'll need to reduce the length of the slipper sides by subtracting from the heel side. The opposite advice for a larger foot. The important thing to remember is that each side must ease around the sole and match evenly at the center of the toe and heel. You can check the sizing by sewing up a quick sample out of batting and trying it on. They should be a bit roomy because the actual slipper is made out of two layers of thick wool. 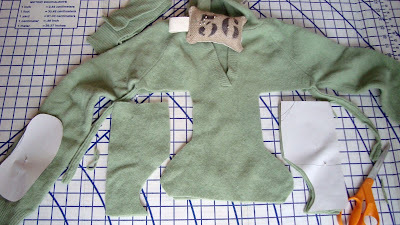 -Pin pattern to sweater and cut out pieces to get the most of your sweater. I tried different placements until I found just the right spots for cutting. 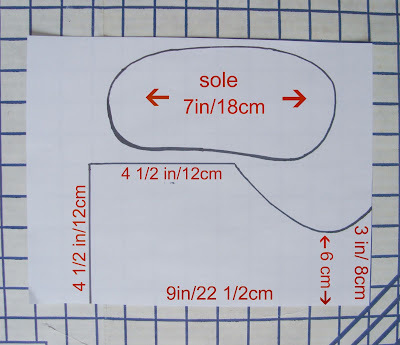 - You will need a total of 8 sides and 4 soles to make a pair of slippers. Try to cut with all pieces having the weave of the sweater going in the same direction. -Pin all of your pieces together right side in, wrong side facing out. If you click on this next photo you'll see that the sweater pieces look inside out. Assembling the slipper sounds far more complicated than it really is. It goes rather quickly, you'll be surprised. 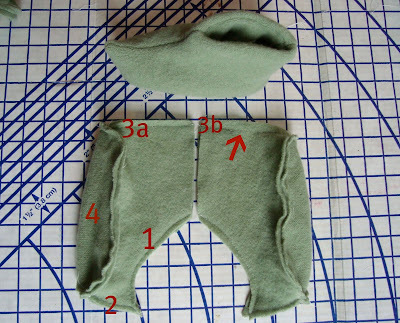 Use the numbers on the photo for reference and sew the outside and liner at the same time. They are identical with the exception of 3b. Use a 1/4 inch seam allowance. 1. sew up the top front seam. 2. sew up the toe seam. 3a. determine which side will be the outside and sew up the heel seam. 3b. sew up the heel of the liner keeping 1 1/2 inches unstitched in the center for "turning". See photo above. 4. Attach sole to slipper sides making sure that the front and back seams stay centered at toe and heel. I would recommend pinning at this stage, but it's not necessary if you're fairly brave and have measured accurately. Remember to keep all of the right sides facing in. Now, it's starting to look like something! -Now, all that's left is the turning of your slipper to the right side. 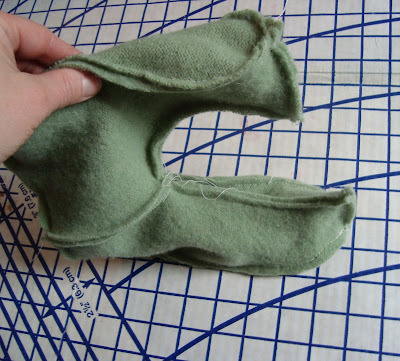 Gently pull both slipper pieces through the opening in the heel. Poke the pointy toes out and into shape with a pencil eraser. 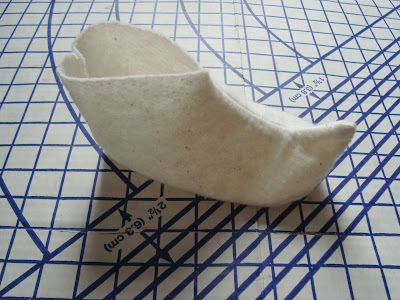 Arrange the liner inside the slipper and sew up the opening with needle and thread. I embellished these with little dots cut from a contrasting sweater. You can add your own touch with needle felting, embroidery, buttons, etc. These are so soft and warm, but slippery too. I plan on putting some anti-skid dots on the bottom. I might try some recycled suede. If you want to make them more secure on wild dancing feet, simply slit holes through both layers around the ankle and weave a ribbon through for a tie... like these. Felted wool won't fray, so this is easy. Please, let me know if you have any questions. I'd also love to see yours, if you make a pair. What a great project! They turned out so cute. Great tip on the batting, too. I recently used polyester fiberfill to do needle felting, which was awesome! Good for practice for beginners! These really are gorgeous Maya. I think I'll have a go with an old blanket for the curly girl - she'll love them. They are really so adorable maya , as is the little elf that is wearing them. I might have to make some for all my little nieces and nephew elves. I have so many old felted sweaters including a pile of very old cashmere sweaters from my mom. An inner layer of cashmere now wouldn't that be lovely. I have been reading your blog ever since is stumbled on to it while doing a search for recycling denim back in Nov. I LOVE YOUR BLOG!!! Ever since it started getting cold out I wanted to make my own slippers. Then I saw the ones you made for your daughter. Love'em!!! Now today I look and there is a pattern. All I have to do is find time to make a pair for myself. It will have to be when everyone goes to bed. That seeems to be the only time I can work and get things accomplished. Love your blog and ideas. So creative and most of all cost effective. Just wanted to let you know that the post is up. Thanks again for such a great tutorial! Love the slippers! Whoa, this crystal clear tutorial blows me away!! You are a structural genius, my friend, and I love how your mind worked to get the inner and outer parts connected--inspired! I love the color you chose, too! Fabric paint is also a good ANTI-SKID choice :) These are keepers! And I love the rabbit too! oh my gosh! I can just see those next Christmas with little red and white polka dots and bells on the outside! Too cute! As always, Maya, your blog is such an inspiration! These elf slippers are painfully cute. I'm still quite intimidated by sewing projects, but your tutorial is fabulous and I'm tucking it away for when I get brave. Can't wait to see MY little elf wearing a pair! You are so cool. My son would kill for a pair of these. Well, I would too. Thanks for sharing your pattern! Very cute! And so easy. Thanks! Um. You're certainly not alone in having wanted elf slippers for as long as one can remember. I have a feeling somebody else, peeking over my shoulder right now, is going to be requesting a pair of these sometime soon. I am so glad you have this tutorial. I was supposed to knit my daughters a pair for Christmas, but I was so busy doing other things I just didn't have the time! Now I can make them some in a couple of hours! Thank you so much for your knowledge and generosity. These are awesome. Your blog is such a wonderful space and everything you create is so inspiring. Thank you. wow, thanks for another great tute! these are adorable! I just want you to know how much I love reading your blog... I visit nearly everyday and appreciate your lovely/creative take on the world... Yeah to you!!! love these! who couldn't use some elf slippers? Elf slippers. What a sweet idea. You should make them for Christmas presents to little ones next year. Aww these are SO sweet Maya! I love when people take an every day item and turn it into something magical and imaginative. So much fun. I'll be linking. I saw you over there on the craft blog.. hoooray HUGS for you! These are so fabulous. I'm definately going to give these a go. I was looking exactly for that. I will propose that to my daughter she will love it too. These are wonderful!! I've been wanting to make slippers like this for a long time! Thank you so much for the instructions. I was just coming up to give you an overdue email and peeped in to see what you have been up to! How fun are these??? Love them and I know my Pajama girl will too! I will be sure to let you know when I do! These are adorable. Thank you for taking the time to post a tutorial. Thanks for this! I want to make some for myself. I made some slippery knit socks for a toddler recently, and painted her name on the bottom in large script using a mixture of acrylic paint and latex mold making material...just tacky enough to break a skid, and the acrylic made it a nice color. I'm a little behind so I guess you already know that your mum's barn studio was featured on whip up. congratulations anyway! these are so cute!! thanks for the pattern and template! and i hear that you live down the road from one of my absolute best friends!! small world indeed, and that much kinder. i see you'll be at squam. i'm trying my hardest to get myself back up to NH for the Sept. workshop! These slippers are so so cute!! Great tutorial! Love the tip on the batting! I wish I could coerce my wee one to wear something like that...sigh. Maybe one day! Don't we all secretly want elf slippers? I knit myself a pair years ago (from an Elizabeth Zimmerman pattern) and wore them out, I loved them so. oh, great googley moogley! now i have a way to make a dent in the ton of felted sweaters that i have sitting in an armoire (bonus is more room in said armoire for more fabric...mwahhahah!). oh and the pretzel recipe...thanks so much for that one! we have never made them before, but we can't wait to try. Kevin, what does your post have to do with the tutorial that you posted on? I think you need to stay off the computer at 2am. Awesome! I have read a lot on this topic, but you definitely give it a good vibe. This is a great post. Will be back to read more! Please come visit my site Mesquite Texas Yellow Pages when you got time. I wanted to thank you for this great read!! I definitely enjoying every little bit of it :) I have you bookmarked to check out new stuff you post. Please visit my Please visit my blog when you have time Please come visit my site I wanted to thank you for this great read!! I definitely enjoying every little bit of it :) I have you bookmarked to check out new stuff you post. Please visit my Please visit my blog when you have time Please come visit my site Fullerton California when you got time. Those are fabulous! 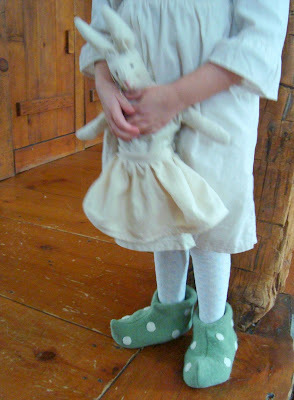 Would you mind if I blogged about them on my recycled wool blog? I would, of course, link back to you. Kris at resweater_ go right ahead, thanks! have just discovered your blog today, after a friend asked me to translate your tutorial, and I must say I'm loving it! Have already become a subscriber, ha! Elf slippers for ALL this year, I say. My MIL is going to go bonkers for them. Thanks everyone! So many have enjoyed this tutorial and this year I've had enough requests that I will try to make some time to make it into a pdf. I wish I could say it would happen before the holidays, but I know that isn't probable. I'm sure you understand. All of my love to all of the little elves out there! These look wonderful! I'd like to make a pair- where do you get/ how do you make the non-slip dots you mentioned? Fortunately, I have 3 teenagers who will LOVE finding these under the tree Christmas morning! I can't wait to see what they look like in a size 12. 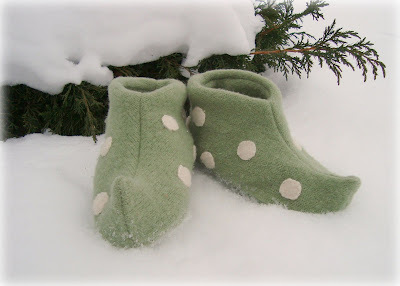 I just found your blog and was wondering if a PDF was ever created for these adorable elf slippers?? they are warm and comfy fit for ALL ages :) well done a great project to work on with the kids! Have any suggestions for making them in a woman's size? I've been meaning to make these for ages and have now finally gotten around to it! Love this tutorial, such a lovely thing to make! wonderful! I made ​​a post on my blog, see if you like! Thanks so much for the tutorial. I made some for my 1 year old as well as her 1 yr. cousin! Not as cute as yours, but I'm pretty new at sewing. I love em! I made these last week out of green glitter felt for elf costumes..my 5 and 7 year old girls were in a lip sync over at the high school. Thanks! i fell in love with this!!! i have to try, are sooo cute! I have an old Christmas sweater I'm going to use. Thanks for the tutorial! 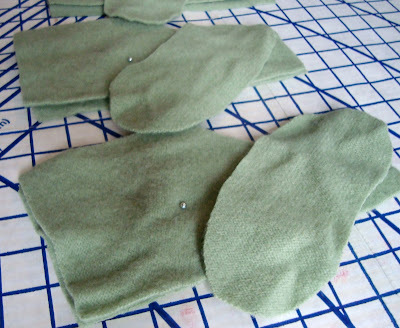 I didn't follow it exactly, but just enough to make Seven Dwarfs shoes/slippers for our Halloween costumes this year! 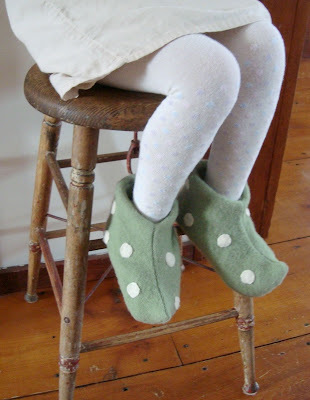 I'm going to try this with a piece of fleece I have, and I'm going to make them considerably larger, as my feet are not those of a 4-6 year old... Great tutorial, especially since you don't have to use felt, or a sweater. 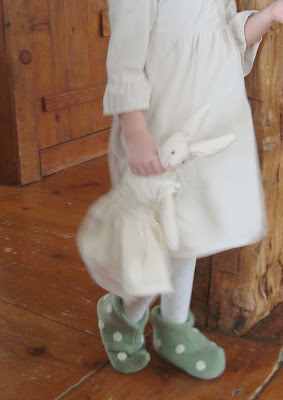 That's aside from the fact that they're adorable elf slippers that are modeled by a little girl with a stuffed bunny. Just added bonuses. Part of what might have contributed to the toadstool slippers' non-elfiness was perhaps the lack of a curly toe (that I could see) and the split in the middle? Both of them are awesome and adorable anyway though! I'm 70 and used your pattern to make bright red gnome slippers for my gnome Halloween costume. I made them bottomless so I slip them over shoes to go trick or treating with my granddaughters. Thanks for the pattern! I made myself a pair! ;P It was a little off because I'm new to sewing and dont quite know how to edit size, but they worked out nice! Made them in white tho :P Thank you! This is my favorite slipper pattern I have found.